Cyborg Superman has infected the Green Lantern power battery, like a virus infects a computer network. Which is exactly the effect it has on everyone’s power rings. It’s a shock to everyone, including the reader. Because who knew Cyborg Superman could transmit his consciousness into technology from light years away? I always thought he was just a Superman-themed cyborg. So now he’s a Superman AND Green Lantern-themed cyborg. With such a compromise in effect, all the Lanterns are at his mercy. And the Guardians. Because they’re all MORONS to not see how their entire network is F-ed up. I mean, really, aren’t the Guardians supposed to be all-knowing? Don’t the GLs monitor the power battery in some way, to keep it clean and running like a Swiss watch? Apparently not. Mike Perkins rendering leaves a bit to be desired. His faces are expressive, but somehow distorted, but not in an exaggerated way. More like he took a bit of exaggeration too far. But that’s okay. One thing I’ve learned about these bi-weekly books is that no artist sticks around too long. Probably next issue they’ll bring in Ethan Van Sciver to illustrate the conclusion. 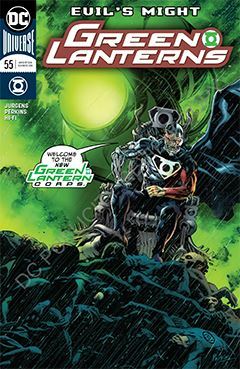 I suspect this will all build up to the forthcoming The Green Lantern title, which suggest there will only be one. Perhaps the others will have be killed, and if so, it won’t be long before Hal tries to create a new Corps.